I think the jugde imediatly fell in love with our borzoi girl Anna, she could say anything wrong about her. So we gained an easy Best of Breed!!! and I got full score in handling, max was 30 points and I got 30. Then of to the youngsters. Well Lucky was so happy and tailwagging that the judging was not the easiest task, but he did awsome. Also with Star, but she tought she could make her way winning by kissing the Judge over and over. At the end of the judging it seemed they both had the exact same amount of points, and she made Lucky best puppy of the breed, and also this time I had for both puppies 29 points on handling!! Because of the rain, we had to go indoors for judging best puppy in show, but indoor or outdoor, it didn't matter to Lucky, he managed a great second best puppy in show!! Then we had to hurry outdoors, in the rain again, to go on to brace class. In brace class you have to show a boy and a girl of the same owner, so I went with brother and sister. There where 10 braces so I never tought we would be in the last line up. I only tried to practise this 3 times, but hey, there we where getting second best brace in show!!!!!! Then it was quick over to Anna, she had to go in the ring in FCI group 10. Because the Judge was already in love with Anna earlier the day, I felt It had to go ok, and it did. This time again indoors, she floated to a groupwin very easily. Again hurry hurry, because of my high score in handling I had to be in the contest for best handler. 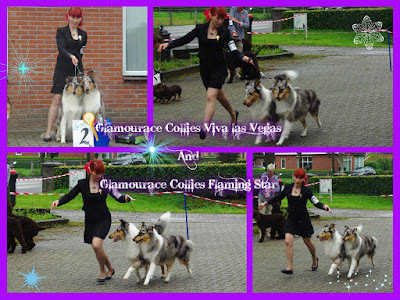 First I was thinking of going with Anna, just doing it the easy way, but then I tought, let's go for something not so logical, I took Star, a pup of almost 8 months, into a handling contest with all the tricks and stuff, that are not ussual in the normal showring. And we did it. 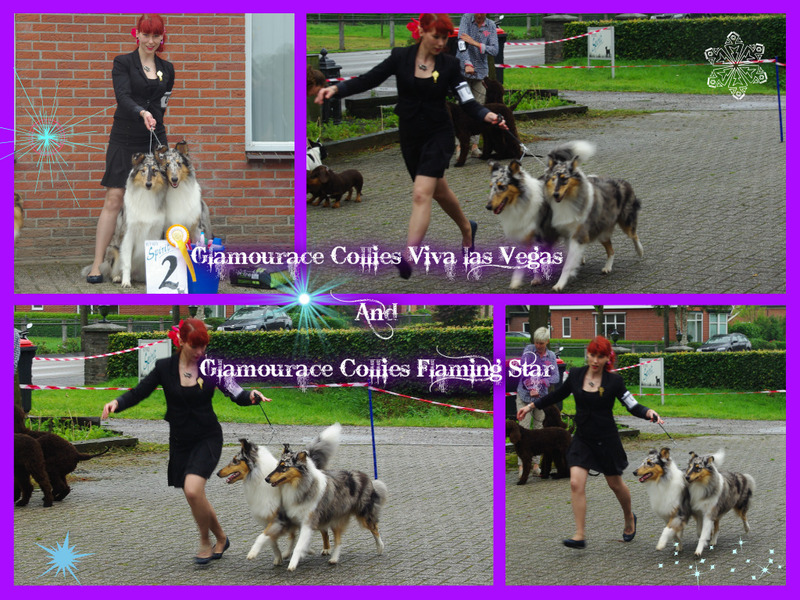 Star was confused every now and then, but we got awarded third best handler in show!!! Then for the big finalle, I had to show Anna again, as a real borzoi she was tired and bored. Only the running was ok for her, but she would show herselve anymore. When the judges where looking I could bring her head up allert with a little meat, and it was enough to convince them she was pretty. The team of judges of the whole day decided she could go reserve best in Show. I was so over the moon (I still am actually) With 3 dogs I got to win 7 ribbons and a great day. As I'm writing this, the dogs are still a bit tired of the show yesterday. Esspecially the youngsters.